When choosing your airbrush, you will want it to meet your current requirements and go beyond those as you progress and you'll want something that is going to last. We're happy to offer as much assistance as we can until you're completely satisfied that you're making the right purchase. Our website offers specifications, general advice and recommendations for types of user. Whereas if you contact us or one of our authorised resellers, we can tailor the advice to your specific needs - narrowing the choice of available airbrush models down to the best few models for you. What will you use the airbrush for? What type of paint or fluid? What level of detail or width of area? What degree of control would you like? What may be your future needs? If buying online, make sure these requirements match the specifications and advice on our product pages. Or please contact us and we will guide you through this series of questions to gain a clear understanding of your needs and recommend the right airbrush. You may call us for anything from a full analysis of your needs to just a quick check on compatibility of one airbrush feature. It's just so important to be sure before you buy and there is no substitute for personal expert advice. Airbrushes can be used for so many applications, such as Art, Graphics, Spray Tanning, Cosmetics, Model Painting, Cake Decorating, Crafts, to name but a few. So which airbrush model is right for your application? Click here for a list of applications with links to suitable airbrushes. 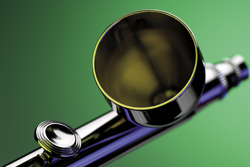 Lookup your application on our Application Compatibility Guide, then click on the names of airbrushes that are shown as R for Recommended, E for Excellent or G for Good. Those listed as 'R' are our top recommendations so that gives you the shortest list to consider. You can extend your browsing to those with E or G if you have different requirements or preferences from the mainstream or if you are looking for one airbrush that is a good compromise between two different applications. If browsing the airbrushes through our product listings, click on the product for a full description and not far down the product page you'll see a list of applications that the airbrush is suitable for. Use the Airbrush Comparison Chart if you already have a good idea of which features you want and you wish to see all the main specifications directly compared in one place. For more advice, or if in any doubt whatsoever, please contact us. We can narrow down the choice to one or two airbrushes that are the best for you and your budget. Anything you can brush paint, you can spray paint - hence the myriad of airbrush applications. Any fluid can be sprayed through an airbrush providing you can thin it to a milky consistency, which is the general rule-of-thumb. Within this rule, the viscosity may range from that of skimmed milk, through to semi-skimmed up to creamy milk, which will depend on the paint you use and to a certain extent your own personal thinning preferences that you will discover. If you are spraying more viscous (thicker) paints or paints with heavy pigments, you will require a larger nozzle size. Airbrushes with the largest 0.5mm nozzle will cope best with the heavier, more viscous paints, while you have to be much more careful what you put though the finest 0.2mm and 0.18mm nozzle airbrushes, which are great for the thinner, finer-pigmented paints. Always read the paint manufacturer's own thinning/reducing guidelines, which sometimes recommend nozzle size, and remember the general milky rule-of-thumb. Please contact us for advice on which nozzle size bests suits your type of paint. Intuitively, you can assume that a smaller nozzle produces a finer spray pattern and a larger nozzle produces a wider spray pattern. However, Iwata airbrushes are so well designed and engineered, that even the largest 0.5mm nozzles are capable of producing fine lines, making them very versatile airbrushes. So it becomes a question of how fine you want to go beyond that. If a fine line of approximately 0.5mm is fine enough and you also want good base coverage, then don't compromise the versatility by going for an airbrush that can achieve a hairline or ultra-fine line. If finer lines are a big factor, then look at medium nozzles such as 0.3mm or 0.35mm, which give a good balance between fine detail and width of coverage (and for medium viscosity paints). If the finest lines possible are your main requirement and you will only use this particular airbrush for working on small scales, then consider the airbrushes with nozzles ranging between 0.18mm and 0.23mm, while heeding the above advice on paints. Since all Iwata airbrushes can produce fine lines, the choice about whether to move up the range becomes more about how much control you want. We believe the entry-level into the Iwata range, the Revolution Series, out-performs many other brands' top models. So why would we recommend something from a higher series in the range? Well, we wouldn't recommend it if it didn't offer a choice of extra advantages for working better at what you are doing. Our policy is to not over-sell, but to make sure the airbrush suits your needs and budget. Having the happiest customers maintains the good reputation we pride ourselves on and yields more word-of-mouth referrals. The Eclipse Series are higher-flow than the other Iwata ranges, using more air and delivering paint quicker, so these are good for laying down base coats quicker and producing fine lines at speed. The higher series airbrushes, such as High Performance Plus through the Hi-Line series to the Custom Micron airbrushes, are more highly engineered for finer nozzle/needle combinations and amazing smoothness of mechanical control, but the main distinction in performance is how well these atomise at lower pressures and lower air volume. This mean you can work slower. Working slower equals more control. You can build up paint coverage in multiple finely atomised passes until you achieve the perfect shade or blend. You can 'pull fine lines' with a much slower pass allowing you more time for careful aim and controlling direction. The other major choices when it comes to control, is whether you want a dual-action or single-action airbrush, and whether you want a conventional airbrush top button style trigger or a pistol trigger (a convention borrowed from the airbrush's bigger brother - the spray gun). These choices are covered in our glossary of terms below as they are common technical jargon in the airbrush industry. Please click on the blue links to skip to: single-action, dual-action, top button, pistol trigger. UK warranty is 5 years on 'NEO for Iwata' airbrushes and it is extended to 10 years on Iwata airbrushes. It's all very well getting the perfect airbrush (and compressor) when it comes to meeting your immediate needs and we'll help do just that. However, you may want to avoid the expense of changing your airbrush if you branch out into a different application or you progress in skill and out-grow a budget airbrush. It's not possible to be clairvoyant about a future interest you've not yet discovered, but it is quite easy to think about all the other airbrush applications you know about and whether you feel you have any interest in them, and thinking about what level of skill you aspire to in your chosen application. Most importantly you should ask yourself how much time you could see yourself spending airbrushing in future if you really get into it as a profession or a hobby, or if your circumstances change such as an up-coming retirement. If you will rely on performance from your airbrush now then it warrants making the best choice as an investment, and if you can predict you will need greater reliability in future then do factor this into the investment decision. Basically, it is a significant investment - so aim to make it as 'future-proof' as possible. What is your budget? With a range of airbrushes from the budget NEO Series to the flagship Iwata Custom Micron, we have an airbrush to suit all your requirements discussed above within your budget. Look at your budget carefully, as getting the best you can afford now is much less costly in the long run than buying twice. Most expensive is not necessarily best for the purpose, so we would help you decide that. Cheap un-branded airbrushes are useful for people to try out airbrushing as beginners before committing to investing in a quality tool, but the downside is that these airbrushes can hold you back, limit your growth, make airbrushing seem more difficult than it really is and ultimately can put people off airbrushing altogether. So if budget is the biggest factor, then do look at stretching the budget to the NEO for Iwata airbrush. The NEO is the only budget airbrush on the market with a 5 year warranty. If you spend less than the price of NEO you would most likely be purchasing an airbrush that is effectively of disposable quality. We maintain our reputation by catering only to the quality end of the market. If a tight budget leads you to consider imitations of the Iwata airbrush that you would have really preferred to buy, then please consider the pitfalls outlined in our Buyer's Beware Guide and the distinct advantages of buying the genuine article. If your budget encompasses the Iwata Revolution or any of the other Iwata series, then you can benefit from a top-performance airbrush that will last you a lifetime with proper care and maintenance, along with a 10 year UK extended warranty against manufacturing defects and the best technical support. Our list of technical terms may help you to decide which airbrush suits you. For help choosing an airbrush with the right features, please contact us. There is no set priority for which feature to select first to narrow down your airbrush choices. Start with the feature that seems most important to you and your application, or let us guide you through the choices on the phone. The fluid is mixed with the air right at the tip of the head assembly inside the cap, and because the air passes all around the tip the fluid is thoroughly atomised to microdot size. All Iwata airbrushes are internal mix as the atomisation is far superior to that of external mix. Click here to view all of our internal mix airbrushes. The paint and air are mixed outside the airbrush as the air passes over the fluid tip. An external mix airbrush will produce a less atomised spray with a larger dot pattern, and is less capable of fine line work. External mix airbrushes give a coarser, grainier spray and are much more prone to splatter. Click here to view all of our external mix airbrushes. A single-action airbrush is one where the trigger only operates one action - the air. When you press the trigger on a single action airbrush, the airflow is turned on and a pre-set amount of fluid will be sprayed. The amount of fluid is controlled by turning either a fluid tip or cone on external mix airbrushes, or a preset knob or preset ring on the handle of internal mix airbrushes. This can be turned with your other hand during spraying, or you may pause work to adjust the preset and then continue spraying when you have re-set it. Either of these methods of using the single-action preset are much more awkward than the instant control of a dual-action airbrush. However, single-action is good for applications where you want long runs at a steady preset spray pattern and the preset prevents you from overshooting. The preset on a single-action works differently than the preset handle that may come with or may be optionally added to a dual-action airbrush. On a single-action airbrush, the preset knob pulls the needle in or out of the nozzle to vary the paint, whereas on a dual-action airbrush the trigger controls the needle and a preset handle acts to limit the range. In either single or dual action airbrushes you draw back the needle a small amount for low volume of paint and hold the airbrush close to the surface for fine lines, and pull the needle back further for higher volumes of fluid and hold the airbrush further away from the surface for wider coverage. As a footnote here, there does exist an opposite type of single-action airbrushes where the one action is the fluid while the air remains constantly on, but these are rare and it is most common that a single-action airbrush has the trigger for the air and a preset for the fluid. Single action airbrushes offer less instant control than dual-action airbrushes, but then this can be seen as an advantage if you want it simpler to control or if you only need set spray patterns, such as spray tanning, base or top coating models, or for pulling consistent lines repetitively. Single-action airbrushes are useful if you find the finger control of double-action airbrushes problematic. Click here to view all of our single action airbrushes. A dual-action airbrush is one where the one trigger controls two actions - the air and the fluid. The trigger is first pressed down for air and then pulled back for fluid. This is typically controlled with the forefinger. The downward movement opens the air valve and the backwards movement pulls the needle back from the nozzle to allow fluid through. It is important to always press down for air first (and actually widely considered best-practice to keep pressed down for air between a series of strokes too), so that the fluid is then always introduced to an existing airflow and atomised immediately. If you pull back for paint at the same time as pushing down for air, or before, then there is opportunity for an amount of fluid to build up at the tip before being atomised and then this is projected out as an initial splatter as the air begins to flow. The ability to introduce the paint more gradually to avoid initial splatter is one of the advantages of a dual-action over a single-action airbrush. The main advantage of dual-action is the instant control you have over the amount of paint and therefore the spray pattern, allowing you go from a wide spray down to a fine line in one stroke (a 'dagger stroke') or vice versa, or even just switch quickly between fine lines or wide coverage on subsequent strokes without having to pause to change a preset like you would on a single-action airbrush. The further you pull back on the trigger the more fluid is introduced. For fine lines or wide spray, the same applies to volume of paint and distance from surface as for a single-action airbrush above, but a dual action airbrush allows you to control both air and fluid actions with one continuous finger movement of one hand. Therefore dual-action airbrushes are favoured greatly by for any artistic applications that require more control and variance in spray pattern, such as art, crafts, model painting, cosmetics, etc. This is why almost all Iwata airbrushes are dual-action and only a few are single-action. Click here to view all of our dual action airbrushes. Gravity airbrushes have a cup or a cavity in the top of the body. Less air pressure is required as the fluid is drawn to the tip partly by gravity. Less air pressure means you can paint slower, so gravity airbrushes are best for fine detail work. Also using gravity means you can put much less paint in the cup than you would have to in a bottle to be drawn up through a siphon tube, so again this makes gravity airbrushes good for smaller areas and fine detail as well as being more economical with paint. Gravity feed airbrush models have differing sized cups because some applications require more paint than others. The Iwata airbrushes with larger cups tend to have medium to large nozzles, so they hold more paint and cover wider areas (although still can produce fine lines also). Iwata airbrushes with small cups tend to have fine to medium nozzles, because these features pair together for applications with predominantly fine work and small areas. With so many combinations in the whole range, there will be the perfect cup / nozzle combination for your application and your own personal preference. Actually, the choice of cup size comes down to personal preference. Large cups are good for larger areas, but you can easily put just a few drops in a large cup for detailing too. Large cups also come with a lid to prevent spillage so you have more flexibility when working at an angle. Small cups are good for small areas and offer greater visibility over and around the airbrush to see your work, so you can use a smaller cup for larger areas if you're happy to refill your cup more frequently. A cavity (or well) is only for the finest applications and small areas such as photo retouching or nail art, but are not very popular as usually a small cup is favoured for the versatility of extra paint capacity. The cups do not need to removable because a large cup can hold small amounts of paint and a small cup can be refilled with more paint, and in fact a cup moulded to the airbrush body is usually shaped much easier to clean thoroughly with no joint to trap paint and no o-ring to deteriorate when using solvent-based paints. The NEO CN airbrush does have removable cups so you can use the cavity, small cup or large cup. This cac be useful for switching between different applications, but really not necessary if you select the most appropriate sized cup for the bulk of the work you do. Click here to view all of our gravity feed airbrushes. A side-feed airbrush can have either cups or bottles plugged into the side which can rotate, allowing the user to work at most angles. The absence of a gravity cup on top of the body allows fine detail work without the line-of-sight over the top of the airbrush being obstructed. The ability to switch between cups and bottles makes a side-feed airbrush the most versatile of the feed types, using small cups for fine work and bottles for broader coverage and for quickly attaching a bottle of cleaner for flushing through between colours. Interchangeable cups/bottles are useful where many colour changes are required as colour can be kept pre-mixed in a bank and also stored for later sessions. With so much versatility, it's quite hard to name many disadvantages of side feed airbrushes, but they are not as easy to clean as a gravity bowl and you will have to spend more on accessorising (purchasing the extra cups and bottles) to get the most out of their versatility. Side cups that have their connector at the bottom of the cup so that the cup sits higher than the airbrush are benefitting from some help from gravity to feed the airbrush. Whilst cups and bottles that have the connector in the middle or near the top of the paint reservoir will sit down to the side of the airbrush and so rely on the same siphon principle as the bottom feed airbrushes to draw the paint up. Click here to view all of our side feed airbrushes. Siphon feed airbrushes that use cups or bottles that plug in underneath the airbrush are often called 'bottom-feed' airbrushes - and sometimes called 'bottle-feed' or 'suction-feed' airbrushes. We will talk about bottom-feed airbrushes here as a distinct subset of the siphon-feed type, as side-feed airbrushes above are also siphon-feed. Bottom-feed airbrushes are particularly useful where large quantities of paint are required. 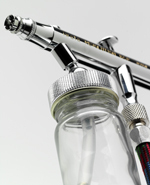 The bottom-feed airbrushes have larger bottles available than the side-feed type. Similarly there is less choice of smaller cups to fit bottom-feed airbrushes, but if you have need for small amounts of paint you should really be considering a side feed or gravity feed airbrush. The same advantages as side-feed of having a bank of pre-mixed colour bottles applies to the bottom-feed airbrush, although the angle of working is not quite as versatile as side-feed as the bottles are in a fixed position and cannot be rotated like side-feed bottles. Click here to look-up which airbrushes are bottom-feed. A hole cut in the handle allows access to the needle chucking nut. Pulling back on the needle chucking nut can pull the needle back a bit further than is achievable with the trigger, so this is a good way to get maximum flow through your airbrush when flushing with cleaner. With other handles you can remove the handle to do this, but a cutaway handle allows you access to do this without the hassle of removing your handle. It is very much optional - not at all a necessity - but a nice bonus feature as standard on the higher-end models. 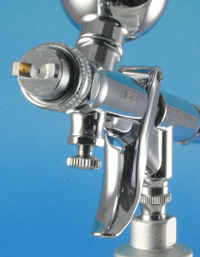 An alternative option for quick flushing is the Iwata Triple Action Handle. A preset handle is an accessory for a dual-action airbrush and works a little differently to the preset knob on a single-action airbrush. You can turn the knob on a preset handle to a position where you want the trigger and needle to stop and limit it from going any further. So you can pull right back and always get that predetermined amount of paint. It's most useful for presetting consistent coverage or consistent lines and helps you avoid accidentally pulling back too far to flood the surface you're spraying. The downside of a preset handle is that it become a bit of a crutch to rely on and therefore may hamper a beginner from truly mastering the control of the dual-action trigger. Having said that, you do get complete control within the preset range so it is great for beginner or expert alike as a safety net to avoid overshooting when painting the most critical lines. A preset handle is an optional accessory for Iwata Revolutions and Eclipses but comes as standard on the more expensive Iwata airbrushes. The Triple Action Handle is a preset handle that also has a Needle Quick Release and a Quick Flush. Another type of preset handle is the new Iwata Triple-Action Handle, which sets a minimum spray pattern instead of a maximum limit of the conventional preset handle, so it can optionally make your dual-action operate a bit more like a single-action airbrush should you need the facility. Apart form the preset function, the other 'actions' referred to in this product's name are a 'quick flush' (ease of pulling back on the needle-chucking mechanism) and a very handy 'quick needle release'. The bonus feature is a thread on the back of the handle to hold your needle cap so you don't lose it after removing it to get in ultra close for the achieving the finest lines. The majority of airbrush models have a conventional top trigger with a finger button. On a single-action airbrush you press it for air. On a dual action airbrush you press it down for air and pull it back for fluid. Iwata Custom Micron Series have taller triggers to give finer control. The extra length of the trigger means a bigger movement at the top of the trigger translates to a finer movement at the bottom of the lever where it pulls the needle. A pistol trigger feels and acts like a spray gun trigger. This makes it easier for people who are used to spray guns move into the smaller scales of airbrushing. Also it is very ergonomically comfortable and can help avoid repetitive strain from long sessions of painting. Due to the smooth and comfortable ease of operation, a pistol style trigger is particularly favoured by customers who suffer with decreased mobility in their hands. A pistol trigger is as easy to control as a single-action airbrush but with the benefit of actually being a dual-action. The first squeeze on the trigger turns on the air, then as you pull back further it starts to engage the needle and so then introduces the fluid gradually. On the best quality airbrushes, such as Iwata, the transition from air to fluid and air is very smooth - like one action - but you can feel a slight increase in resistance where the needle engages which is important for knowing how much to pull back. The pistol trigger airbrushes in the Iwata range are dream to handle and many people do fall in love with them when they test them before buying. However, whether you go for the top button or pistol trigger is purely personal preference as to what is comfortable for you. Many people who have been so used to the conventional airbrush button may find it weird to transition to a pistol trigger at first. Also, if making the switch you may have to take a while adjusting to the difference in aim, having the centre of the spray pattern slightly above your trigger finger rather than slightly below it. Since a pistol trigger is a very personal preference feature to have, we would recommend trying the different types of trigger at shows, on one of our classes, by visiting us or one of our stockists, or by asking to have a go on a friend's. But if you haven't ever used an airbrush before then the pistol trigger is by far the easiest to get used to quickly. The needle packing is a ring or tube of material that fits snugly around the needle to prevent fluid from travelling back into the rear workings of the airbrush. It has to fit tightly enough to stop paint, but loosely enough to allow the needle to move smoothly. The needle packing screw is used to tighten or loosen the needle packing. PTFE (Polytetrafluoroethylene) has an extremely low level of friction and is probably best known for coating non-stick pans. So PTFE is far better than rubber or other materials for allowing the needle to slip through easily while remaining tight enough to obstruct paint. PTFE is also highly resistant to corrosion. PTFE needle packings are much more solvent-proof than rubber o-rings. PTFE packings will last much longer than rubber parts and avoid the swelling and cracking that rubber can suffer when subjected to solvents. An airbrush with rubber o-rings should not be your first choice if you are using solvent-based paints, such as enamels, polyurethanes or alcohol based paints (or indeed solvent-based cleaners). But this does not mean that you cannot use an airbrush with rubber o-rings for airbrushing with solvents - it just means you should be more careful not to leave residue solvents in your airbrush when not in use and you have to be prepared to replace those parts much more occasionally. Conversely, buying an airbrush with PTFE needle packing does not mean you'll never need to replace the packing - it just means it will take a lot more wear than a rubber part. A crown cap allows getting in close for fine detail. The needle cap is the end cap on the front of the airbrush that protects the protruding tip of the needle from getting damaged. A crown cap is a type of needle cap that has cut-outs in it, making it look like a crown. The cut-outs allow air to displace when you are getting very close to the work surface whilst still protecting the needle. So a crown cap is a great accessory for doing fine detail safely. You can purchase a crown cap for many of the Iwata models of airbrush, and it comes as standard on the highest models, The Custom Micron Series, which are designed for the finest detail. Many people remove the needle cap completely and opt to not use a crown cap because you can get even closer without any cap at all. Plus this gives the absolute best visibility of where the tip is pointing for accuracy of aim - but with the greatest risk of stubbing the needle on the surface! If you choose to work without a needle cap, then we strongly recommend you have a spare needle on hand in case of accidents. Working with a damaged needle can cause damage to your nozzle, which is the more expensive part. Also if you take your needle cap off, put it in a safe place where it won't get knocked on the floor and remember where you put it! If you lose it then you'll putting your needle at risk the whole time until you can buy a replacement, and not just during your finest work. You can attach the needle cap to the other end of the airbrush so you don't lose it if you accesorise your brush with a Triple Action Handle. All conventional airbrushes have a round spray pattern. If you spray close in one position without moving you'll get a round dot; if you spray further back you'll get a circle darker at the centre and fading away at the edges. The paint leaves the nozzle in a round shape because the nozzle aperture is round and the spray then spreads in a cone-shape towards the surface you are spraying. If you intersect the cone anywhere at 90 degrees you will get a circle. If you spray at any angle other than 90 degrees to the surface then the round pattern becomes skewed. You can spray at any angle as required by your application, but to get perfect round patterns and an even spread on dots and lines you should hold the airbrush perpendicular to the surface. The Iwata HP-TH has an airbrush body but with a fan pattern cap like a small spray gun. Click here for a feature comparison of Iwata airbrushes. A fan pattern is common on spray guns. Many spray guns offer both a round pattern and a fan pattern. A fan looks like a fan in the air, instead of a round cone of spray, and thus makes a much wider band of paint on the surface you are spraying. The actual nozzle remains round, but the fan pattern is achieved by directing more air through two holes either side of the nozzle aperture, which then pushes two sides of the atomised spray inwards into a flatter shape - effectively squashing the round cone into more of an ellipse. The fan pattern is actually slightly oval-shaped. Sometimes the term 'oval pattern' is used to describe a pattern in between the round and the maximum fan. Full-functioned spray guns have a fan adjustment to allow less air through the fan holes to fan the spray less and allow it to spread more into a rounder oval/ellipse. The Eclipse G Series have fan patterns. They are named 'airbrushes' by Iwata because they perform like large airbrushes, but actually they have the body and features of small spray guns. Whereas the Iwata HP-TH is unique as the only airbrush in the range with a fan pattern head interchangeable with its round pattern head. Click here to for more information about Iwata airbrushes. Click here to view a comparison of features of Iwata airbrush models. We put us much information and advice online as we can and we will keep adding to it and improving it. We know we can help you find the airbrush for you over the phone to make a purchase that is perfect for you. However, there is really nothing better than trying airbrushes first hand and comparing how they feel and perform. After narrowing down the list of models to those with features that match your application and budget, it is a really good idea to then physically try those two or three airbrushes against each other to make sure which is the perfect one for you. You can do this at shows, on one of our classes, by visiting us or one of our stockists, or by asking to have a go on a friend's.